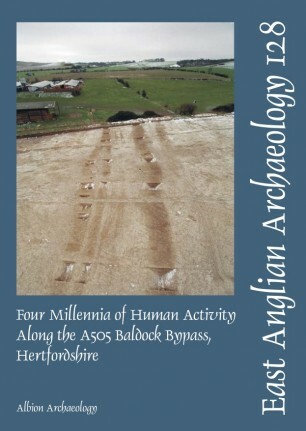 This report presents the results of archaeological investigations undertaken in 2003–5 along the 6km route of the A505 Baldock bypass, Hertfordshire. The evidence spans the late Neolithic to the medieval period, although no evidence for activity from the later 5th century to the beginning of the 11th century was found. The late Neolithic evidence was dispersed across the route corridor and comprised bowl-shaped pits, shaft-like pits and a small funerary enclosure. Early Bronze Age activity was restricted to the northern portion of the route and included a small roundhouse and a cluster of seven barrows. These barrows subsequently became the focus of burial activity in the late Iron Age and earlier Roman period. Evidence for early to middle Iron Age activity was concentrated on the Clay-with-flints soils of the Weston Hills. It comprised clusters of pits and occasional post-holes which were grouped into a series of activity areas. The pottery recovered hints at a chronological shift from north to south. These activity areas are thought to represent evidence for more permanent settlement, although the actual dwellings are assumed to lie outside the route corridor. Roman boundary ditches and enclosures were found across most of the route corridor. Although evidence is somewhat piecemeal, there does appear to have been a reorganisation of the land boundaries, evidenced by infilling of later Iron Age boundaries and the excavation of new boundaries along a different alignment. Dominating the evidence for the Roman period were two roadways, each displaying a sequence of maintenance and repair. Both roadways lead into the Roman town of Baldock and both were on a similar alignment. A study of the repair sequences and associated finds suggests that a continuing problem of drainage and silting on one road led to the construction of a slightly realigned replacement. Evidence for medieval settlement was confined to the northern portion of the route corridor, and included a rectangular enclosure containing a cemetery, pits and post-holes, with evidence of a hollow way running along the western side of the enclosure. Analysis of documentary evidence strongly suggests that this enclosure can be identified as the 13th-century Hospital of St Mary Magdalene in the parish of Clothall. Woodland clearance along the route appears to have been complete by the early Bronze Age, with the earlier landscape probably a patchwork of woodland, pasture and cultivated fields. This clearance appears to be associated with a reduction in the numbers of pigs kept by the Bronze Age farmers, and the development of a pastoral economy based upon cattle and sheep. Much of the route from later prehistory onwards has been open calcareous grasslands, probably well grazed by sheep, which became increasingly important in the local economy; much of the wealth of medieval Baldock derived from wool.